Solving for equilibrium price and quantity with incomes and substitutes added in - FreeEconHelp.com, Learning Economics... Solved! Where Q is quantity measured in 50 pound cases, P is the price per case in dollars, Pl is the price of unskilled labor in dollars (the wage rate=$6), Pc is the price of capital as a percentage, I is family income and Ps is the price of California oranges. b. 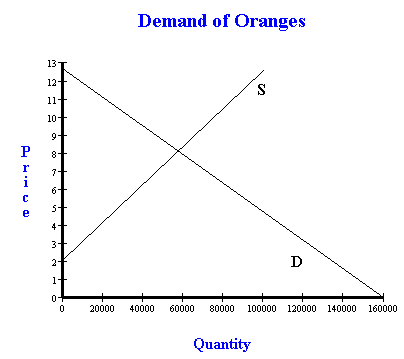 What is the equilibrium price and quantity for oranges? c. Suppose the price of labor increases to $8 (Ps=$8) what happens in the market? So no oranges will be supplied until the price of a crate reaches a minimum of $2. The associated supply curve will look like the one in the graph below, the intercept on the X axis occurs at -20,000 (which isn’t shown) and we see that positive amount is supplied once the $2 threshold is met. 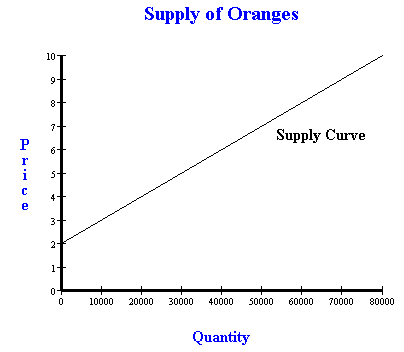 Also, the curve slopes upwards with a slope of 1/10,000 (rise over run, or price over quantity). Next for the demand curve. QD = 45,000 – 12,500 (price of oranges) + 4 (family income) + 2,500 (price of California oranges). 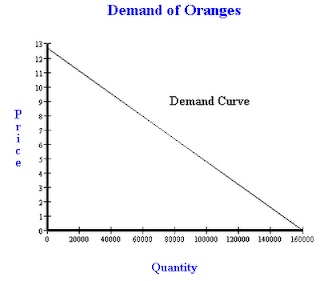 We can then use this information to plot a demand curve. The intercept on the Y axis occurs at a price of 12.8, and slopes downward with a slope of – 1/12,500 (rise over run, or price over quantity). 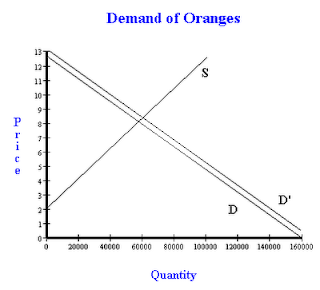 We can solve for equilibrium price and quantity in the orange market by setting either QD equal to QS or the two prices equal to each other and then solving. To be consistent with prior posts, I will set QD equal to QS, solve for P, then plug in the solved P value into our QD and QS equations to back out equilibrium quantity. 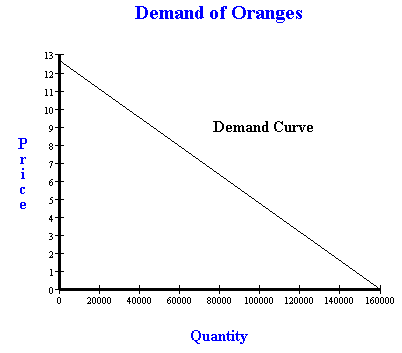 So the equilibrium quantity of the orange market is going to be 60,000. You can see in the graph below that this results in the demand curve shifting right/up, which will result in a higher equilibrium price and equilibrium quantity. We can figure out equilibrium price and quantity by again setting QS = QD. Again our quantities match, so we know that we did the math right!